Sportswear is commonplace in fashion these days. The Olympics are nigh and we’ve already seen its influences on certain collections. From couturiers Chanel and Dior (who have both used sneakers in their couture collections) to other high-end brands like Mother of Pearl and Margaret Howell, sports luxe has been infiltrating the fashion industry for many years now. Sports as a whole hasn’t really hit the catwalks in some time. However, during London Collections Men, Marjan Pejoski is bringing sportiness back to the catwalk in its truest sense. American sport, Russian futurism and German electronic brand Kraftwerk all influenced the collection. A boy’s sports-room and the geometric nature and minimal colour scheme inspired the collection. The flaming red burst throughout the collection knotted the three main influences together. Baseball was the prime influence for the collection. The lacing of a baseball lined bomber jackets, and trousers. These pieces will be bestsellers. From the list of people I’ve seen wearing KTZ, pieces like this are the ones they gravitate towards. A bottle-green hoodie with black and white detailing was my personal favourite, along with a patched, leather varsity jacket. The baseball lacing on one pair of shorts looked perfectly fine until I saw the literal interpretation of baseballer’s uniform; they were ticked into knee-grazing socks. Also seen at J.W. Anderson, boxing shoes were worn by models in the collection. 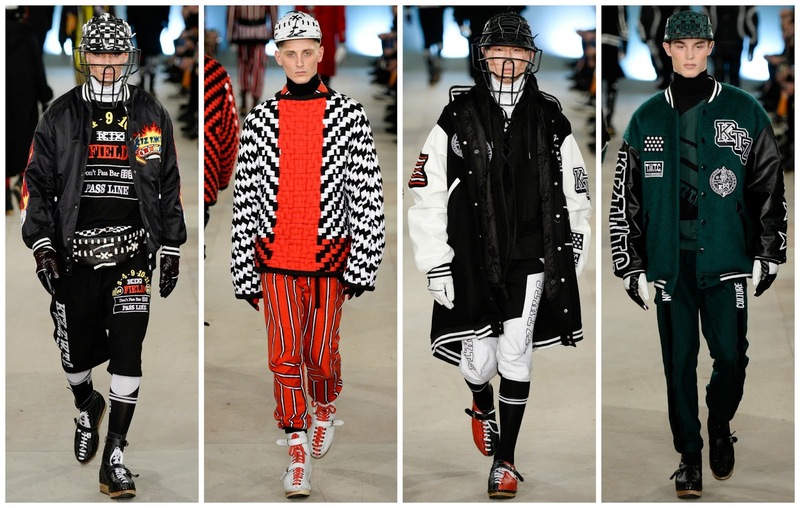 After opening a store, Kokon to Zai, in 1996, Marjan Pejoski launched the label KTZ in 2003. Though he may be a Macedonian designer, the label was birthed on UK soil and it remains a very important part of the brand’s identity today. Two models emerged at once, the British flag draped over their respective shoulders, buttoned at the waist. Underneath, one of the models wore a soldier’s jacket that instantly resembled Sarah Burton’s Spring 2016 collection for Alexander McQueen. Instead of dabbling with gender fluidity this season, I have noticed designers channelling womenswear collections. The influences of Alexander McQueen and Vivienne Westwood were present her. In other collections this season I recognised Marc Jacobs and Vetements. Athleisure is often contrived. Luxury brands seem to glamourise sports and it works, it does. Marjan Pejoski’s fall KTZ collection restored a certain amount of believable grit, in a glamourous way, to sports inspiration. 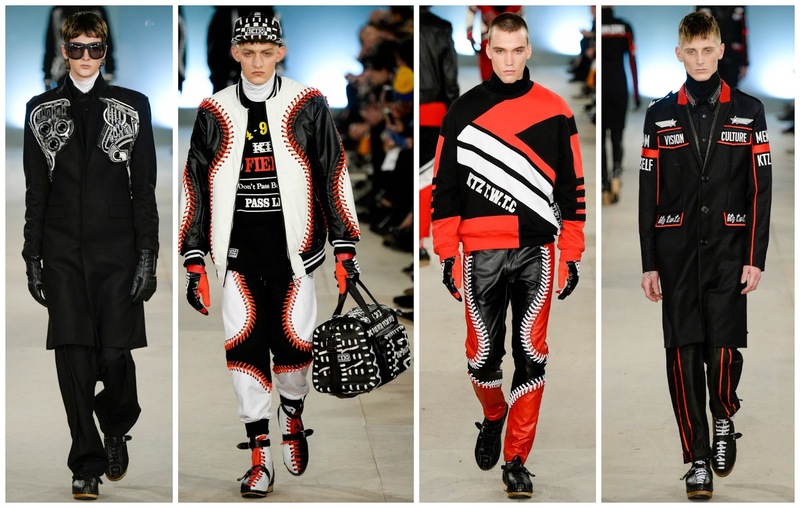 It’s the varsity jackets that KTZ fanboys and fangirls will be clamouring for next season.